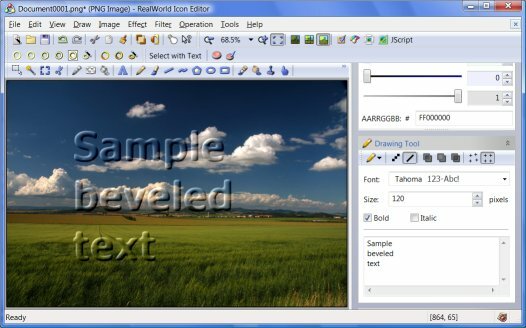 RealWorld Icon Editor and other RealWorld Designer application have a bevel effect. It bevels the image outline as defined by alpha channel or selection. To create a beveled text, it is necessary to create selection shaped as the text. Then it is a simple matter of running the Bevel filter from Effect menu. Click Tool presets toolbar from View menu. Click Add custom preset (the big red button icon) from the toolbar that appeared in the previous step. In the Add custom preset window, check the Edit tool field and set it to SELECT_TEXT. It is also recommended to set the Name to something sensible, for example Select with Text. Click the Select with Text button that appeared in the toolbar after completing the previous step. Press ESC to cancel the selection.